So Donald Trump is going to visit today the grave site of Andrew Jackson, slave owner, and thus further identify himself with racism, white nationalism, Native American expulsions and other things irrefutably bigoted. As I had asked earlier, why does Trump revere this reprehensible figure? I raised these questions after a Federal court in California has issued an even broader order against Donald Trump's immigration and travel ban: what happens when Trump refuses to honor the third branch of government's legal role? You've probably seen recent articles and punditry from the likes of Steve Bannon, Rudi Guiliani and New Gingrich, et al, comparing Donald Trump to his early 19th century predecessor Andrew Jackson. You know - - "Old Hickory," the blunt, slave-owning crusty outsider, a legendary holder of grudges, etc. You'd think truths about Andrew Jackson would dissuade any modern politico from embracing him - - slave ownership and more, for example - - unless that's a willing Alt/Right subtext. 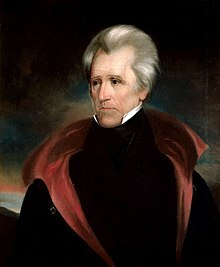 Then there's the absolutely reprehensible Jacksonian legacy - - the expulsion of thousands of Cherokee people from their sovereign southern lands (so the stolen property could be handed over to fellow slave owners) - - which wittingly or not, Trump could emulate by expelling millions of Mexican immigrants and/or also ban (or expel) Muslims from our shores. And here's one extremely troubling bit of Jackson lore to file away which may be why Trump's brain trust worships Jackson despite all his faults. Let's say that a court rules that Trump is in violation of the US Constitution's anti-bribery prohibition and must completely divest his businesses. "Well, John Marshall has made his decision; let him enforce it." Get the joke? The Supreme Court doesn't have an army. But given Trump's one-man band personality and the like-minded authoritarians around him, can't you see him and his people responding the the same way when legal orders Trump doesn't like or respect come his way? Trump and Andrew Jackson? For better or worse, Old Hickory had a military record of some renown. The Wiki says: "Jackson's service in the War of 1812 against the United Kingdom was conspicuous for bravery and success." But what does Trump say when Barron asks: "What did you do in the war, Daddy?" Cue the New York Times of 8/1/16: "He stood 6 feet 2 inches with an athletic build; had played football, tennis and squash; and was taking up golf. His medical history was unblemished, aside from a routine appendectomy when he was 10. The deferment was one of five Mr. Trump received during Vietnam. The others were for education."